I am SO happy to be writing this blog post, because it means that I’m nearly at the end of a journey that I’ve been on for many years! 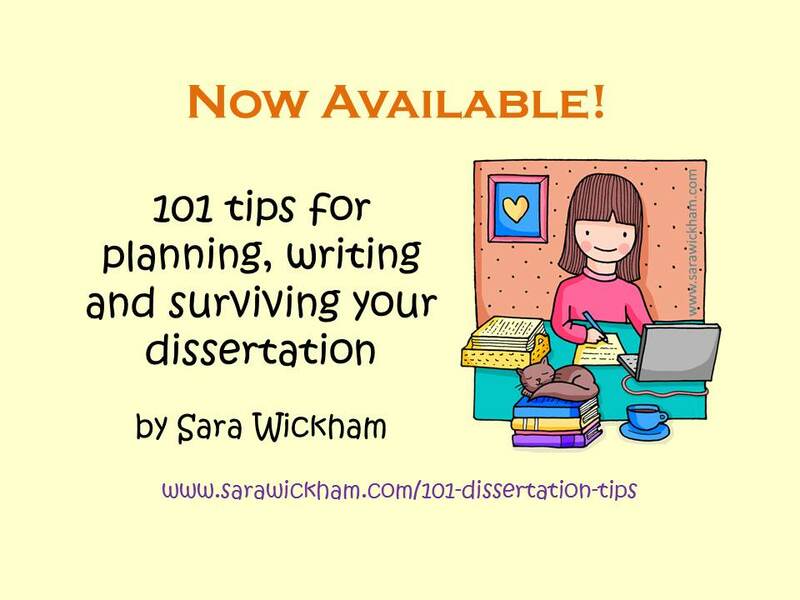 I am delighted to announce that this post begins the final countdown to the publication of my new book, 101 tips for planning, writing and surviving your dissertation! I wrote my first dissertation in 1995, as part of my undergraduate midwifery degree. It was called, “Decision-making and childbearing women: the influence of heuristics on the place of birth decision”. In it, I explored why, after the publication of Changing Childbirth and evidence showing that home was just as safe a location for giving birth as hospital, weren’t more women deciding to stay at home for their births. I looked at decision-making theory, cognitive psychology and the literature on how people deal with risk (can anyone see the beginnings of a career trend here?!) and realised that there was a LOT more that could influence women and their families other than the statistics on safety. On that journey, I enjoyed the process of researching and writing so much that I ended up helping several of my student colleagues to make sense of their own dissertation journeys and decided even then that I wanted to do a PhD one day. First though, I went off to be a midwife for a few years and travelled all around and met lots of lovely families. Then, one day, while still being a midwife, I decided to do a Masters and I got to write another dissertation, yay! Much of this one, which was about anti-D and ended up being titled “Anti-D: exploring midwifery evidence”, got written at night, in the break rooms of two different hospitals while I was working as a midwife. (I never did like going to sleep on night shifts!) Regular readers of my work will know that I went on to write lots more about anti-D, but that’s another story. After my Masters, I decided I wanted to become a midwifery teacher as well as a midwife, so off I went to work for a University where, when they realised that I actually LIKED statistics(! ), I became the module leader for the research curriculum and the dissertation. Which was just fab, because it gave me a chance to try to get other midwives to like statistics and research. I’m not sure how well I succeeded at this, but I went through a lot of jelly babies, chocolate, magic tricks, games and other fun stuff trying, as evidenced by this book! And yes, I later wrote a PhD thesis as well, so that ended up being a total of three dissertations of my own and, thanks to leading the research and dissertation curriculum for quite a few years and then also doing tutoring and assessment in a few other roles, I’ve helped several hundred students on their own dissertation journeys. All of this meant I had lots of notes, ideas, tips and handouts on my computer, and it seemed a shame to have all that experience and all those notes and tips and enthusiasm and ideas just sitting there, so I spent the summer of 2015 turning them into a book. And I am delighted to tell you that it is now published, and you can read more about it here or it’s available from Amazon UK, Amazon.com, Amazon France, Germany, Canada, India, Italy, Mexico, Spain and the Kindle store. I really hope that it will be useful to those of you who are on your own research, writing and dissertation journeys, as I haven’t held back and it is jam-packed it with everything that I have learned along the way.